A class with a slight degree of difficulty. Some rotary cutting experience is necessary as well as general sewing experience. 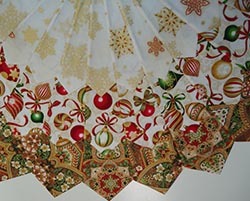 This gorgeous Triple Dresden Tree Skirt uses the Creative Grids 15° Ruler and a "quilt-as-you-go" technique. Finished width of tree skirt is 48". Requires purchase of pattern. Confident beginner and up. 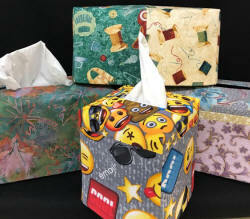 Learn how to add binding to your blocks for a touch of color! Get started on your Gypsy Wife quilt in this hands-on sit 'n sew! Requires purchase of book. The Boxy Tote was designed to hold a Singer Featherweight Sewing Machine. It has a rigid metal frame that holds the mouth of the bag open and offers protection for its contents. Intermediate and up. Requires pre-class preparation and purchase of pattern. 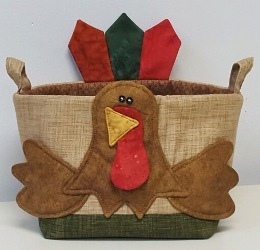 Add a little fun to your Thanksgiving dinner with this happy gobbler! The basket is lined with Insul-Bright so it's perfect for serving up some warm buns! Requires purchase of pattern and some pre-class preparation. Learn how to embroider on organza and create a beautiful accent for your home on your embroidery machine! 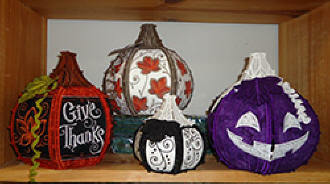 Class includes choice of embroidery design, organza and candle holder. Bring your machine and USB stick to download design. The Triangle Frenzy Table Runner uses Creative Grids 60° Triangle ruler and a stripe to make this quick and easy runner. Confident beginner and up. Fast, fun and highly "giftable!" An easy-to-sew project that will get you hooked! Requires purchase of pattern. Confident beginner and up. 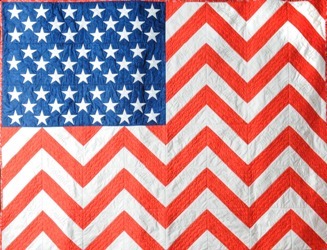 This beautiful design makes a large flag quilt with the Pledge of Allegiance embroidered throughout! 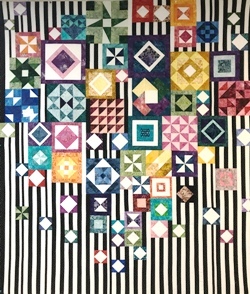 In our hands-on class, we will concentrate on creating the star patches and demonstrate the flip 'n sew technique used to make the stripe blocks. Requires purchase of embroidery CD. So cute!! 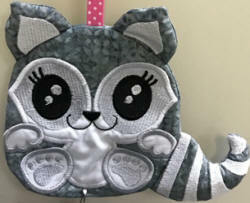 These cute little purses are sure to bring a smile to everyone's face! Choose from Raccoon, Bunny or Owl. Embroidered completely in the hoop including the zipper! 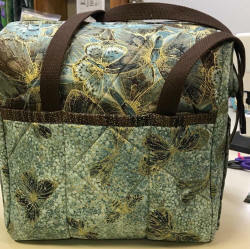 Bring your embroidery machine and USB stick for hands-on creating! 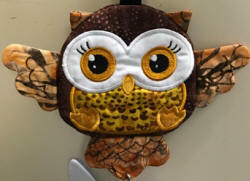 Class fee includes one embroidery design (your choice) and hardware.